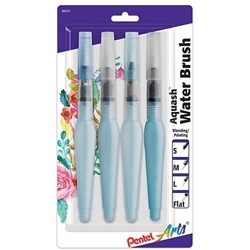 This waterbrush set includes three rounds in fine, medium and broad, and one flat. The durable, nylon bristles of these self-wetting brushes hold a point and can create broad strokes as well as fine lines. The soft easy-to-squeeze barrel is comfortable to hold and it contains the water needed to create a beautiful watercolor painting. The brush can be used with watercolor crayons, markers, watercolor pencils and traditional watercolors to smooth and spread color, and create an array of dramatic effects.